Now you can make those paper airplanes "really" fly! 3 - 2 - 1 ...Ready for take off! 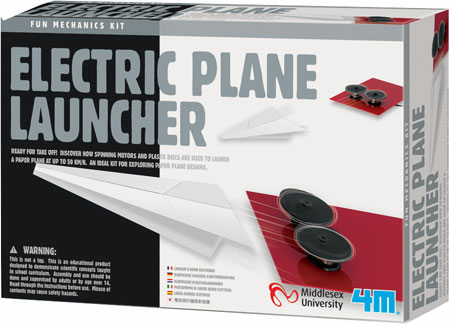 This do-it-yourself science kit contains everything you need to learn how spinning motors and plastic discs are used to launch a paper plane at up to 31 mph (50 km/h). Includes components for assembling the launcher and detailed instructions. Requires 2 AA batteries, not included. Ages 5 & up. Adult supervision recommended.